As a cop, I gave this topic a lot of thought over the years and I’ve picked up a few techniques that actually work. I’ve been in dozens of fights and without a single exception, every fight eventually went to the ground. Of course, for a cop, you aren’t interested in hurting the suspect (some of the time – it involves too much paperwork), but there are situations where it is life or death and you can’t use a weapon (I’ve got a couple wild war stories). However, as a civilian, you don’t need to worry about not hurting your attacker. In fact, the more damage you can inflict on your attacker, the greater your chances of escape and survival. The trick is to inflict sudden, immediate painful damage. A cop, if he can, usually gives an aggressor warning, “Police, don’t move.” Again, you don’t need to worry about doing this. Giving a warning only lets the other guy get set. One thing an attacker relies on, either consciously or subconsciously, is surprise and shock effect. To the unprepared, it can paralyze you and make you a victim. The victim will simply stand there for a moment giving the attacker the necessary time to immobilize him. To the prepared, you can use it to turn the tables. By training yourself to immediately react, you can use your own surprise and shock effect against your attacker. I’ve said this before and I’ll keep saying it: Mental Preparedness. Surviving is about being prepared ahead of time and mental preparedness will get you through the hardest of times. You’ve got to be willing to do whatever it takes to survive a violent encounter. If you are squeamish about inflicting damage on a person you’ll go the way of the Dodo bird. The following ideas and techniques should be used only in a situation where you are in danger of serious bodily injury or death. If he can’t see, he can’t fight. If he can’t breathe, he can’t fight. If he can’t stand, he can’t fight. In my not-quite-so-humble opinion, the eyes are among the most vulnerable and arguably one of the most defended external organs of the body. Nobody wants to lose their eyesight. I’d rather be deaf than blind. This is why it should be one of your top targets for disabling your attacker. Think about how bad it feels when you get a simple eyelash in your eye; it’s highly irritating. Now, think about how irritating it would be if someone jabbed his finger in your eye. Use whatever you have at hand to jab into an attacker’s eyes: fingers, pens, pencils, car keys, etc. The idea is to see if you can tickle the inside of the back of his skull with your finger or write your initials with a pen. If it’s either you or him, it must be him, so do whatever it takes to come out alive. If you gouge out his eye, you can always hand it back. Also, you can always wash off your finger later or buy a new pen if it doesn’t work afterward. Striking the nose is another good way of blinding your attacker. I know the media and some martial arts experts say you can kill a person by striking the nose in an upward angle using the palm heel, but this is hyperbole and something you’ll only see in the movies. The nose simply isn’t made to have bones break off and go into your brain. However, if you’ve ever been whacked in the nose, you know that you forgot all about what you were doing because of the pain. What you don’t want to do is strike the nose from the front. It is designed by the good Lord to withstand this type of abuse. Sure, it’ll hurt and may make the attacker stop for a second, but a more effective strike is from a 45° angle. With a strong enough punch, the nose will break, causing a ton of pain and tears. This will give you a chance to either make a follow-up strike to the eyes, throat or knees, or run. If your attacker grabs you around the arms from the front or back, headbutt him in the nose using the forehead at the hairline or the back of your head. Be careful in doing this; you’ve got to be sure to hit the nose. In head to head contact, the person that initiates the headbutt usually is the loser in this contest. You probably won’t break the nose with a headbutt, however, it can cause enough pain to give you time to break his grip for a follow-up attack. The throat probably is the second most defended part of the body. It is essential for breathing and if struck hard enough, can cause death by suffocation within a few minutes. Getting struck in the throat is painful and potentially life-threatening, but it needs to be done correctly. Again, getting struck from the front of the throat will cause some pain, but again, the throat is designed to withstand some types of impacts. The 45° angle strike is best. If you are far enough away from your attacker, use your fist and hit to either side of the windpipe in a hooking motion. If you hit hard enough, the larynx will break and swell, and it’s, “Saint Peter, open the gates,” unless you do an emergency tracheotomy. The other way to hit the throat, given the right circumstances is a knife hand or ridge hand strike. While these strikes can be effective, they usually will hit the front of the throat. If you are in close and can’t throw a punch, my personal favorite is the elbow strike. This can be a devastating blow when done correctly. Hitting an attacker with an elbow strike is like hitting him a brick. Your hand is made up of a number of bones that compact a bit when it strikes an object. You also run the danger of breaking some of those bones. With your elbow, it is solid as a brick, and when swung in an arc, it generates some serious speed. Lastly, the knees and ankles. Break either one of these on your attacker and you can stroll leisurely away. It takes about 20 psi of force to hyperextend the knee and unlike the throat or nose, a frontal strike will do the trick. What is nice, too, is that a strike from just about any point forward of the knee will work too, and you don’t need to be a martial arts expert to do it right. You need to learn three types of kicks for hyperextending the knee: front or snap kick, sidekick, and instep. These are fairly easy to learn and take only a small amount of practice. The two tricks to an effective front kick is lifting your knee before you strike and pulling up your toes or using your heel. Pulling up your toes exposes the ball of your foot, which is what you want to use for striking the knee. There are plenty of videos out there to learn how to do an effective front kick. Depending on your position to the attacker, simply strike the knee with the same force you’d use to kick a football. Make sure you follow through. Once you hyperextend the knee, you can stand back and call the police. You’ll probably need to stand back far enough so you can hear the dispatcher above the screaming. Going for the ankle is also an effective strike and is useful when you are too close to your attacker for a strike to the knee. The only kick you need to use is one that little kids do all the time when throwing a temper tantrum: the stomp kick. Using either the outside or inside of your foot, aim at a spot about four fingers up from the ankle bone. At about a 60° angle, stomp down and listen for the bone to break. You’ll not miss it since it is very loud. Learning these strikes and kicks is very easy. YouTube has tons of videos out there showing you just how. Remember: Practice makes perfect. Something to think about. If your attacker is drunk or high on drugs, you will need to damage him much more severely to stop him. I once arrested a man for DUI, who had cocaine and THC in his system in addition to the alcohol. His BAC was .227, so he wasn’t feeling any pain. The fight was on when I told him he was under arrest. During the fight, I broke his humerus clean through in two places. It was so loud it could be heard more than 200 feet away. The suspect didn’t feel it and continued to fight. It took two of us about two minutes to subdue him after I broke his arm. One last thing. 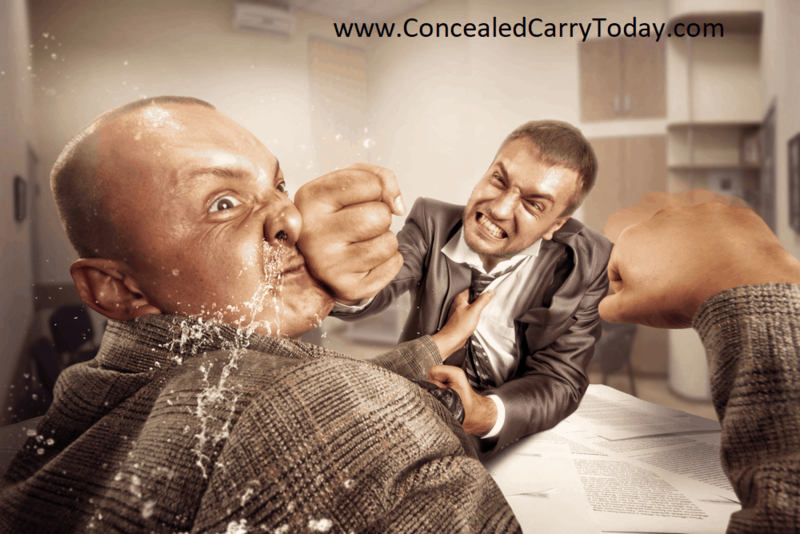 In any type of unarmed self-defense SHTF situation, be prepared to get hit and/or injured. In all the fights I’ve been in, I escaped getting hit only five or six times. You’ve got to be willing to take a punch, get hurt even to take out your attacker. However, your body already has a solution for this: adrenalin. In one fight, I had my ribs caved in by a man and I didn’t feel it until two hours later. I was able to stay in the fight and take him out. Of course, later, I got a free trip to the emergency room, but he went to jail and I went home. Do I Need a Concealed Carry Permit for Pepper Spray? While I agree with the warning / regarding warnings there is a legal aspect to “verbally warning a possible assailant” that should be noted and learned. This verbal warning in strong command voice can alert others that YOU are the victim, and allow easier prosecution of the attacker.